Red Plague is a term that refers to a specific type of silver-plated copper corrosion. Some wire/cable manufacturers have found a way to minimize the likelihood of red plague. There is an industry accepted method for measuring key factors in a wire’s red plague susceptibility. Any concept that has earned the word “plague” in its name is certain to be an infamous hassle. The “Red Plague” of the aerospace industry is no exception. For decades, the plague has been identified with corrosion impacting the performance of silver-plated copper conductors. Some have brushed the issue aside saying that they have never seen it, thus it is not a problem. To put the issue of red plague into perspective, a worst-case estimate suggests as much as 3% of braided silver-plated copper shields have some degree of red plague. Across the aerospace industry, this equates to millions of dollars each year in scraped products, rewiring, and maintenance actions. This article provides an overview of the subject and a means to determine susceptibility. Corrosion is the chemical process that converts a refined metal to a more stable form, such as its oxide or hydroxide. Galvanic corrosion is an electrochemical process induced when two dissimilar materials are coupled in an electrolyte that promotes corrosion (the same process used in batteries, which rely on galvanic corrosion to generate voltage). The galvanic corrosion of silver-plated copper conductor, often insulated by ETFE and other fluoropolymers, is generally known as Red Plague. Contact between dissimilar metals can results in rapid corrosion. 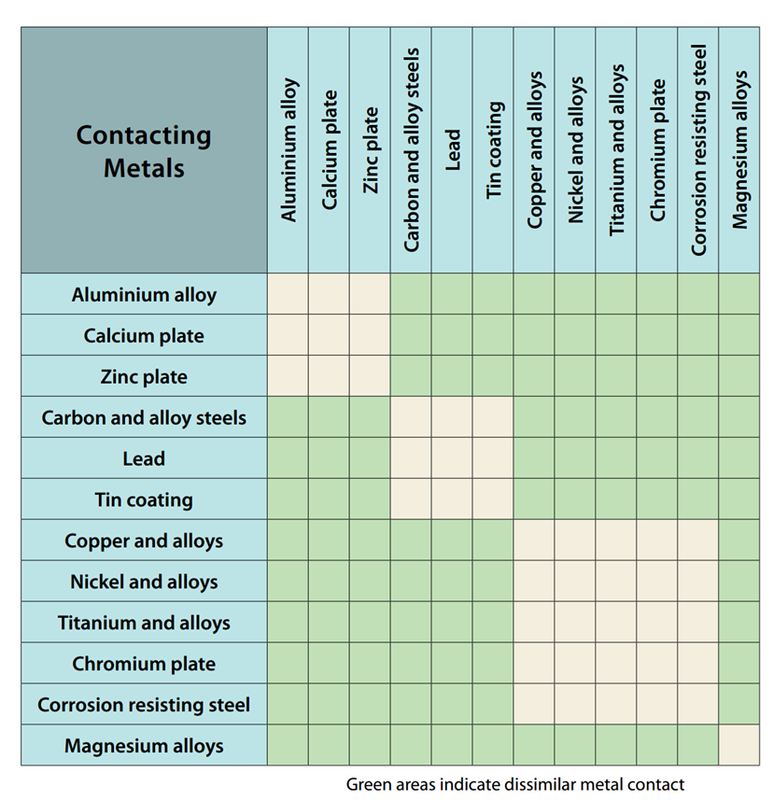 This chart shows the compatibility of several common aircraft metals. . Source FAA. Contact between dissimilar metals can results in rapid corrosion. This chart shows the compatibility of several common aircraft metals. Source FAA. Red plague is not a new concern in the aviation and wiring industries. In fact, the issue pre-dated the original March 1965 article, penned by P.L. Anthony and O.M. Brown, which examined causes and outlined conditions for Red Plague evolution. The Red Plague, when visually observed on corroded wires, is identified by either a red or black tarnish, where the red is the cuprous oxide (Cu2O) and the cupric oxide (CuO) appearing black. Silver plating of the copper alloy wire strands inhibits corrosion, although production flaws, handling, environmental factors, and application conditions can alone, or in concert, defeat the inhibition of corrosion. A recent concern regarding Red Plague evolution is the destruction of the copper core can occur when the conductor’s silver-plating is intact and of sufficient thickness (>40 µin). The first possible culprit of the corrosion was water. Water is used to cool wires during the production process and some aircraft operate in very humid environments. The ingress and depositing of water can happen through wicking from unprotected and exposed connectors or through the condensation during thermal cycling. However, it is not possible for water molecules to diffuse through the silver layer, nor is the silver susceptible to oxidation or corrosion in moist air. The search for the corrosion promoter then went looking into the wire insulation constructions. Some fluoropolymer insulations are known to off-gas. Of interest were the wire insulation types that off-gas fluorine. This fluorine could react with the water molecules to form hydrofluoric acid. This acid weakens the silver plating, forming pores allowing water to corrode the copper core. In their 2010 Red Plague control plan, NASA identified protecting wire from high humidity air as a significant mitigation technique and suggested that all aqueous exposure be eliminated. As such, while making the silver plating thicker can provide some benefit, the wire/cable insulation and jacket material performance hold an important role element in preventing the corrosion. Each manufacturer has a different process for making and curing their insulation, and it is this variability that creates the problem with some manufacturers and not with others. The process control has a significant impact on the off-gassed fluorine concentration. Off-gassing is something that may not be fully eliminated from these problematic insulation types, but research has shown that <20ppm is unlikely to produce red plague on silver-plated samples. What is Susceptible to Red Plague? To help combat the plague, Lectromec employs Fluorine Evolution testing of fluoropolymer insulations to help our clients determine if a wire/cable is prone to promote Red Plague. The test evaluates the off-gassing of fluorine from the insulation in the absence of conductor material. This method measures the concentration of fluorine dissolved in pure water and compare the measured electrical conductivity to the control. The greater the concentration of fluorine dissolved into the aliquot, the greater the build-up of opportunistic corrosive products on the silver plating that promote corrosion of the copper alloy that lies beneath. 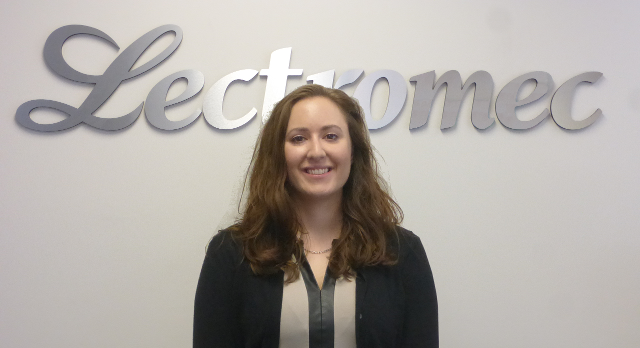 Devon has been with Lectromec since 2017 and has been a key contributor on projects involving wire degradation assessment and wire/cable certification testing. Her skills in Lectromec’s lab ensure regular delivery of accurate test results across multiple disciplines.